The result of Pagani’s partnership with Airbus Corporate Jets came to life at the Pebble Beach Concours d’Elegance, where the Italian automaker showcased a scale model of its Infinito cabin. The mock-up is a bespoke interpretation of what a Pagani-designed airplane cabin could look like in the future. 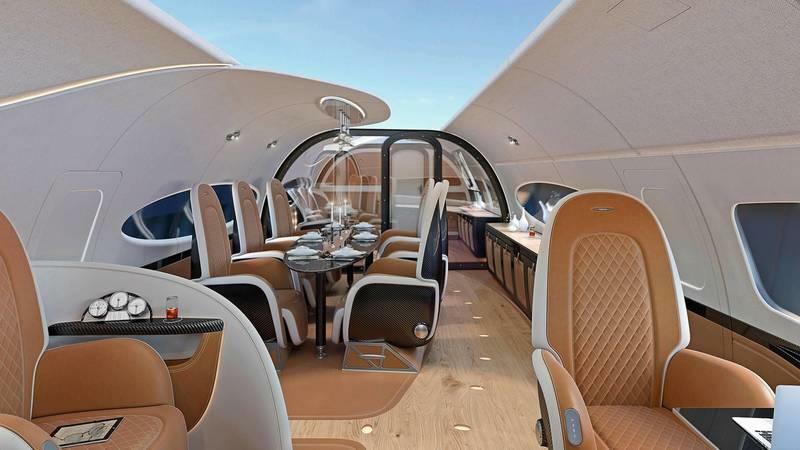 Neither Pagani nor Airbus Corporate Jets have given a timetable on when the Infinito cabin will come to life. 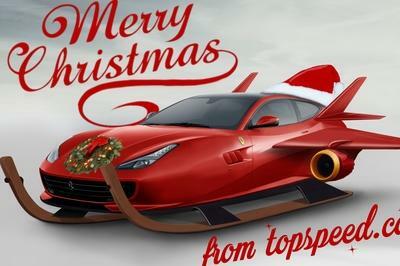 We know Pagani for a different reason — it’s a purveyor of all things that mean exotic in the supercar world — but did we really expect the Italian automaker to create something any less awesome than this? The answer, of course, is no. Bespoke cabins are a Pagani specialty the same way cheap hotdogs and pineapple juice are a Grey’s Papaya specialty. Step inside Pagani’s Infinito cabin, and you’re going to feel like you’re in a five-star hotel, maybe even a six-star hotel if your standards are up there in the clouds. 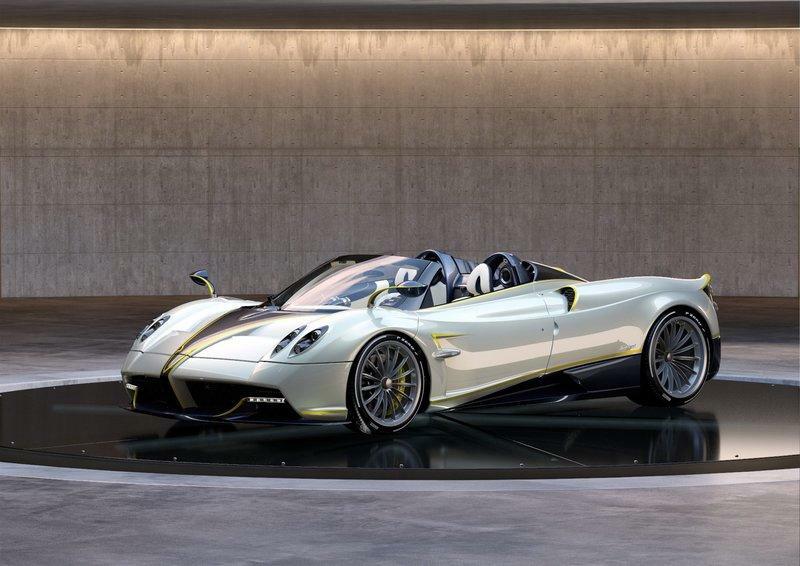 Regardless of your expectations, Pagani’s going to blow them away. The cabin is drowning in fancy leather and carbon fiber, a Pagani specialty. 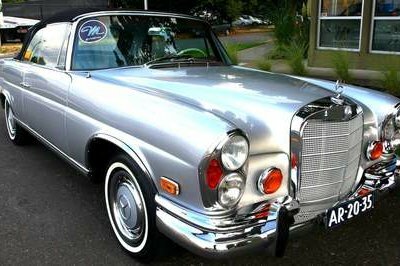 More to that, the floor is wood with certain sections covered in soft-leather carpet. Floor lights are also present, directing a clear path when the cabin lights dim. The seats and the tables are made from the good stuff, as well. There’s also a glass divider that separates the dining area with the lounge area of the cabin. The glass wall, in particular, can turn from transparent to opaque at the touch of a button, ensuring that there’s at least some kind of privacy inside the cabin. Speaking of the lounge, a large flat screen hangs on one side with comfortable lounge chairs placed on the other side. I can think of a lot worse ways to binge-watch Netflix when you’re 30,000 feet above the ground. Once you get tired of watching TV, you turn it off and look up at the glass ceiling of the plane. Literally, the ceiling is made from high-pressure glass — Pagani calls it the “sky ceiling” for obvious and awesome reasons — giving you an unimpeded view of the sky above you. That’s taking star-gazing to a whole new level. Pagani’s Infinito cabin is a masterclass in high-end bespoke design. It’s the brainchild of master designer Alberto Piccolo, who heads the interiors department over at Pagani, and Sylvain Mariat, the automaker’s head of creative design and concepts. 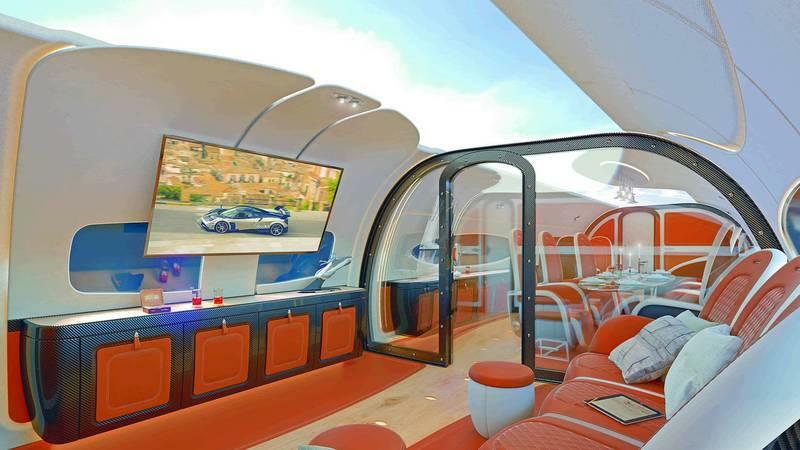 It’s unclear if we’ll ever see the Infinito cabin on any one of the planes from Airbus Corporate Jets, but if the latter wants to set a standard of bespoke cabin excellence, it’s hard to find another interior design that can offer what Pagani created. I’m sure there’ll be a few mockups that will be just as amazing, but none of them will have the sky ceiling. Read our full review on the 2018 Pagani Huayra Gyrfalcon. 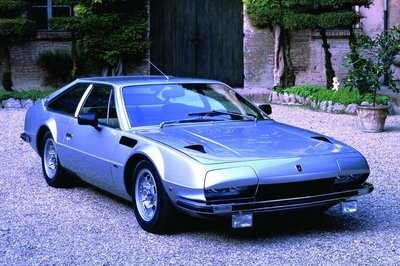 Read more Pebble Beach Concours d’Elegance news. Following the spirit of bringing our Modenese Atelier closer to our customers, Pagani is proud to announce the opening of a new brand showroom in Beverly Hills. Located at Robinson Boulevard, in the gorgeous background of Bel Air and West Hollywood, the brand new Pagani Showroom will offer an exceptional level of service to the most demanding automotive connoisseurs of this outstanding part of the world, by serving as a unique configuration and brand centre. Pagani Beverly Hills is the 2nd stand-alone Pagani dealer in the nation and represents a new chapter of the remarkable story of Pagani in the U.S. which has seen the company putting down roots in Connecticut, Miami, Dallas, Newport Beach and San Francisco. The opening of the new showroom marked the starting point for the 5th edition of our North American customer gathering, the Pagani Raduno – The Drive, with a 1,000 miles covered in just a few days by our passionate customers, driving through some of the most breathtaking Californian landscapes. 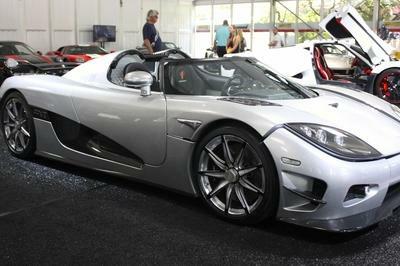 The convoy will reach its destination at the 2018 edition of the exclusive The Quail – A Motorsports Gathering where a highly customized Huayra Roadster will occupy the centre stage, an exquisite example of the highest level of personalisation of the Pagani cars and named Gyrfalcon by its owner, to pay tribute to one of the fastest birds of prey. Air is the overall theme of this year’s presence at the event, with Pagani elevating it’s partnership with Airbus Corporate Jets (ACJ), showcasing for the first time the scale model of the ACJ319neo featuring the Infinito cabin. Together, Pagani and ACJ have created this unique cabin, the quintessence of the Pagani philosophy in a state-of-the-art aircraft: a distinctive style, seamlessly combined with unrivalled material technology. To complete Pagani Automobili’s Pebble Beach car week schedule for 2018, on Saturday August 25th Pagani will be present at the parade of Exotics on Cannery Row as well as at the home of our technical partner Pirelli, to honor the passion that has been linking the two companies for the past 10 years in the relentlessly pursuit of higher technological records to break.